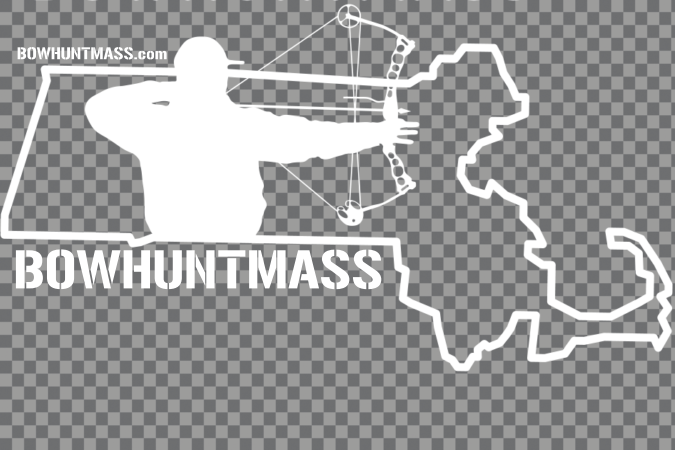 BOWHUNTMASS official Asphalt/Smoke Apparel, available from M-3XL. 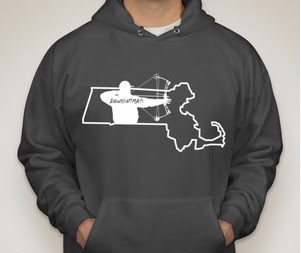 Order today for free shipping, guaranteed delivery in time for Christmas. A very nice buck taken in Zone 4N on Nov 24th by Daniel Crowell. Daniel got this his stand around 2PM on Nov 24th for his afternoon sit. He's had this trail cam set up in this area for quite some time and had a lot of night photos of this buck. Not using any scents (no estrous or buck urine) he sat and waited. He grunted this buck in at about 3:15PM and the buck came in broadside at 20 yards looking for another deer. Daniel drew his Hoyt Maxxis 35 and sent his Rage Xtreme broadhead perfectly into this big buck. A perfect heart shot. Not much blood trail but Daniel recovered this buck approximately 30 yards from penetration. Mostly internal bleeding and an easy recovery. Great deer and great execution! 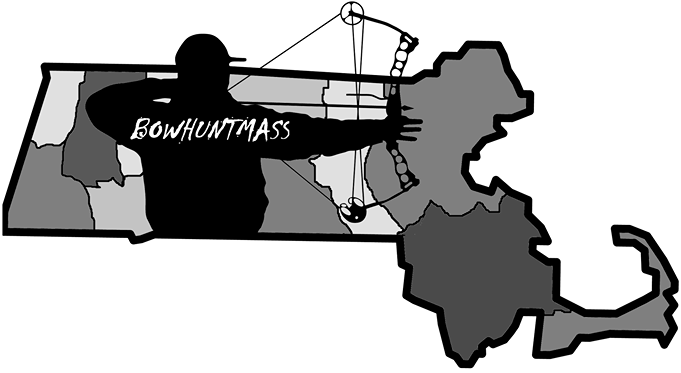 We stumbled across an article on Bowsite.com about Rich W. who hunts in Massachusetts Zone 11. He came into his stand on Saturday morning 11/21 to discover two bucks locked up and picked to the bones by the coyotes. The picture here says it all. Rich was hunting on Wednesday but saw nothing so it had to occur between Wednesday evening and Friday night. It's a unique find for sure, lets you know that rattling may be a good option to bring in those hesitant bucks. When this first came through on our BowhuntMass Instagram account I couldn't believe the pictures. This looked like a Kansas buck with a gnarly rack! Two weeks ago, Chris Nanof shot a small six pointer so he was tag limited. 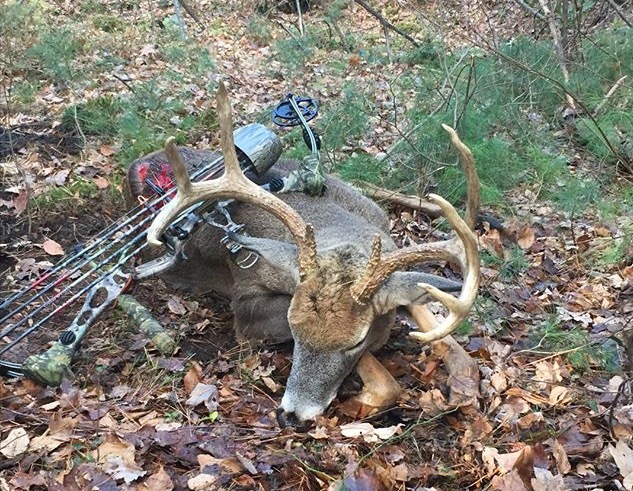 I think he made the right choice in nailing this 170lb Massachusetts 9 pointer. Heading back to a hot location Chris laid down some code blue doe in heat. This spot was on fire the morning of Nov. 14, Chris saw five deer total including three bucks, the action started around 6:25AM when a small doe came through. Next a big 8 chasing a doe came through but didn't allow for a shot at 7:15AM. Shortly after another small 8 pointer trailed behind. Chris checked his phone and received a text that his dad had just missed an "absolute monster buck", about 1500 yards from Chris' stand. 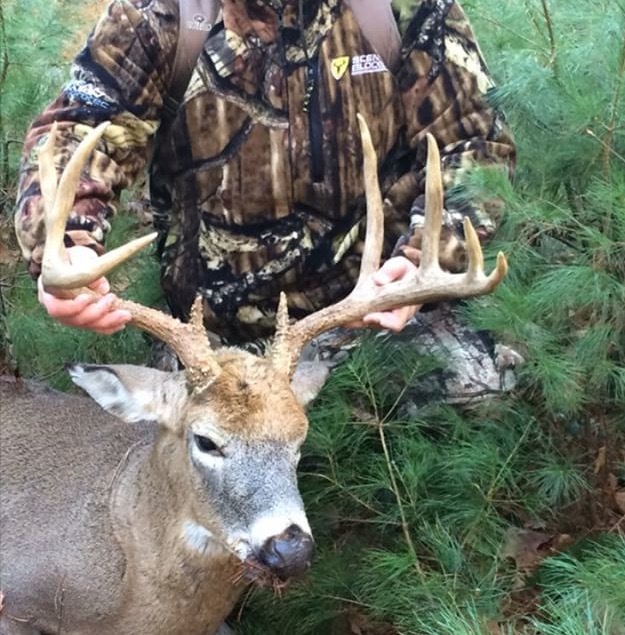 Ten minutes after the text, this same monster was within 15 yards of Chris. At 7:42 AM on Saturday morning Chris buried the nock in this beast. 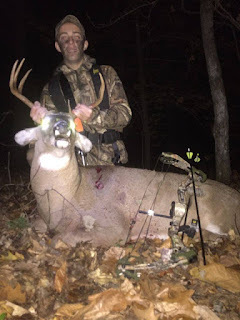 The buck gave him a broadside shot which Chris capitalized on with his Rage 2 broadhead. No tracking blood on this journey... the shot was perfect and laid this bad boy down within 10 yards of the shot. Excellent work, a proud moment for Chris and his dad as well! 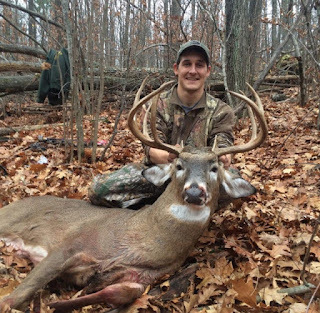 Take a look at this big ol' public land buck dropped by 22 year-old Nick Julius. The back story:Nick Julius was hunting a spot in Zone 9 known for it's share of big bucks. For the last four years he's caught a couple monsters on his trail cam and done his fair share of scouting. After using scent drags for a few sits Nick decided to change it up a little and try going in "stealth mode", no scent drags no estrous doe scents nothing except BowhuntMass.com's personal favorite cover scent Scent Away spray. Soon after Nick texted his father that he was in his stand safely this bruiser rolled over some branches nose to the ground, rolling through at ten yards. Nick hit his grunt call but the buck had something else on his mind and didn't flinch. Nick desperate to get this trophy to stop he called "HEY! 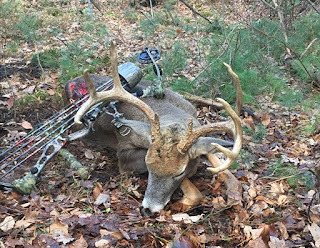 ", the buck stopped for just long enough for Nick to put his Schwacker broadhead into his vitals. 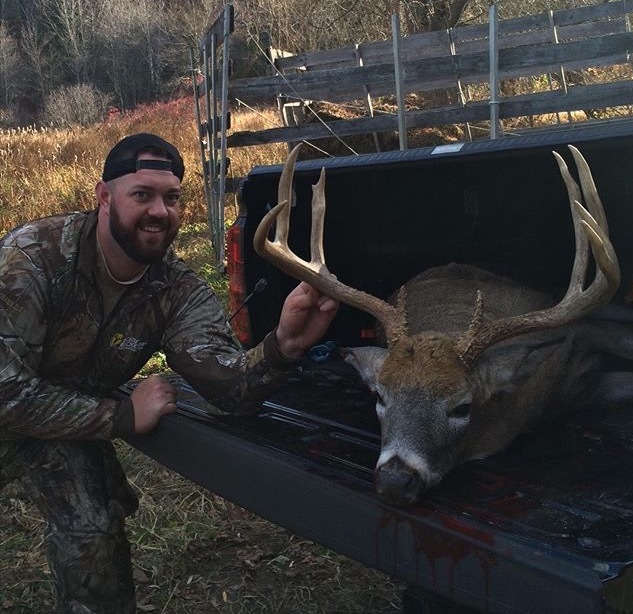 Nick's Mathews z7 Magnum and gold tip kinetic arrow did the trick. Nick knew he hit the buck hard but didn't know exactly how much penetration he had on him. Nick did the right thing and waited the buck out about six hours until he knew it was safe to go recover the buck. 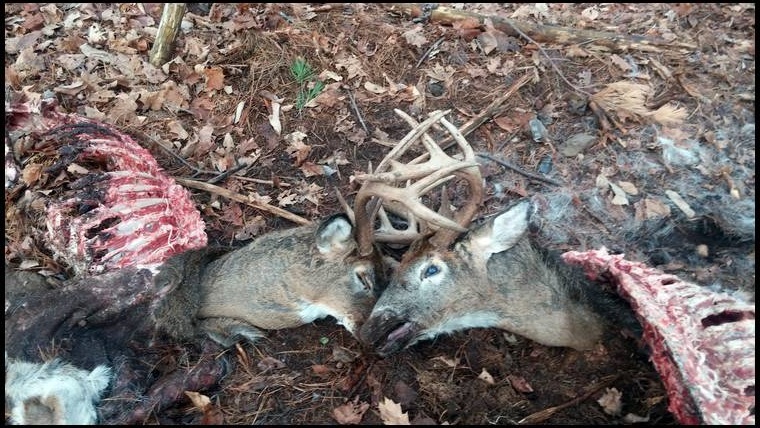 He tracked the blood trail for just about 200 yards where he found this beauty next to a blowdown. A great deer on a great morning. 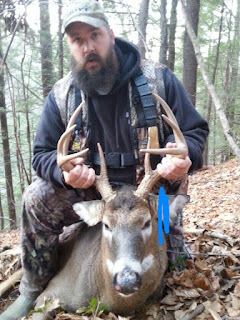 Massachusetts zone 8 Halloween Buck ! BowhuntMass.com follower Jonathan Lapierre shot this big ol' Zone 8 Massachusetts Buck on Halloween evening. Lapierre was using Tinks 69 and a bleat can to bring him in and viola an arrow out of a fred bear compound bow, through the vitals and a short track later (10yds! ), this buck was hauled in. Great deer on Halloween! On the evening of November 14th this Massachusetts Monster was taken down in Massachusetts. A follower of the site sent the information to me in an e-mail but asked that his name and location not be shared since he didn't want the attention or his hunting spot to be released! This hunter used the hocks off one deer#1 from a different location, rubbed them on his clothing and used this as cover scent/attractant. 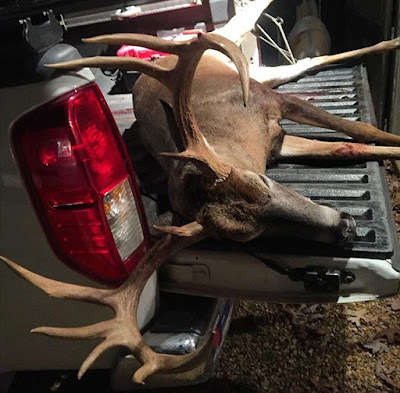 Once this monster smelled the foreign hocks it stopped him dead in his tracks and the hunter took care of the rest... JUST LOOK AT THE MASS on this buck! This is why we love Senator Humason, he supports and sponsors the Sunday Hunting Bill. We are in a waiting pattern but here's what we learned from reaching out to the Senator. Doesn't seem like any progress was made but at least the wheels are moving in the right direction. I like what Connecticut has done, lets hope for a mirror of that! "Thank you for writing to Senator Humason about this matter. The Senator asked me to let you know that the Joint Committee on Environment, Natural Resources and Agriculture heard public testimony on the bill on Tuesday. The Senator has submitted his own testimony in support of the bill. From this point, the Committee will consider any testimony they have received about the matter and make a recommendation for the bill’s next step in the legislative process. "- Senator Humason's Director of Communications. Truck Window Decals Now Available! We launched some new bumper stickers a few weeks ago and they sold out quick! We got some feedback from others that they wanted something they could stick to their rear windows of their trucks. 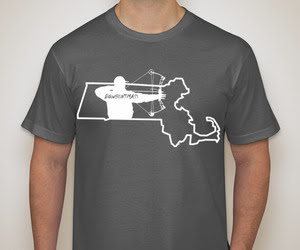 We went back to the drawing board and came up with this new design. It's 4"x6" and it's a white decal with a clear background. 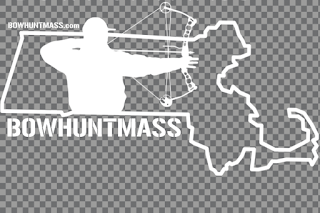 It's $10 and the best way to pay is through the website or send pay pal to bowhuntma@gmail.com.